Barcelona are being linked with some new midfielders at the moment as the club goes through something of a mini crisis in a position in which they’ve historically been so strong. 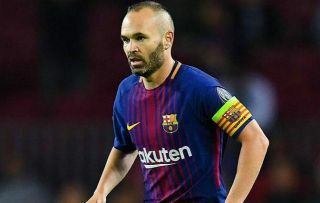 The Catalan giants have just lost legendary playmaker Andres Iniesta this summer, following the departure of Xavi just three years ago. Together, that duo were instrumental in Barcelona and Spain’s success in the late 00s and early 10s, and it looks a near impossible job to replace them. However, Barcelona may have a good deal of money to spend this summer as they’re linked with some big-name solutions in the transfer market. A report today from Mundo Deportivo has linked them with 23-year-old Lazio star Sergej Milinkovic-Savic in a potential £70million move. The Serbia international looks one of the best young players in the world and has the skill, technique and intelligence to play that creative midfield role to perfection for Barca. He has long been linked with Manchester United, however, as Jose Mourinho could also do with a new signing in midfield. United and Real Madrid have been linked with the player in a report by Il Messaggero, translated by talkSPORT. United’s need for a midfielder could be even greater if they lose Paul Pogba this summer, with the France international seemingly another name on Barcelona’s radar. After a frustrating season at Old Trafford it would be little surprise if the 25-year-old were to move on, with Diario Gol claiming United would ask for £88m for him this summer. That shouldn’t be too much for Barcelona, who have been linked with Pogba by Don Balon as Ernesto Valverde also looks to replace Paulinho, who has just left on loan for Guangzhou Evergrande. Together, the £158m duo could be a superb partnership who’d complement each other perfectly and bring Barcelona a properly world class combination in the middle of the park again. While they will never be Xavi and Iniesta, they may be the best realistic bet for the club at the moment if both are available. Pogba, of course, has not looked himself at United but has shown enough from his time at Juventus that he can be a world class performer in the right team, and he’d have more freedom to express himself at the Nou Camp than under Mourinho at Old Trafford. If the Portuguese is foolish enough to not see that potential and let him go this summer, £158m for both players could actually end up being a real bargain for Barca.